Baby girls white Mary Jane shoes. Fastened by velcro and decorated by 2 white bows. 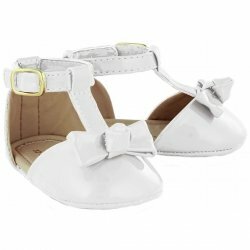 These are soft bottom pram shoes made from white faux leather. Faux leather is man-made leather from a fabric base to look like real leather but softer. Lining is 100% cotton.